Black Bros. Roll Coater and Roller Coating equipment are state of the art machines that are durable and reliable. These roll coaters and glue spreaders offer system matched productivity and easy maintenance. Uniform coverage means higher productivity, optimum quality, and minimal scrap. Our featured roll coater is the 22D-875 Roll Coater, this roller coater is one of the most admired models in our line of quality equipment. Our 22D-875 roll coaters can be found in plants all over the world, still operating reliably over 40 or 50 years on the job. Black Bros. 22D-875 roll coaters can coat the heaviest substrates in the most rugged environments or use its precision to achieve extreme accuracy of coating weights. Standard sizes start at 44″ (1118 mm) and run to 74″ (1880 mm) wide. Built to provide service 24/7, with a heavy duty welded steel frame. The Black Bros. 22D-875 glue spreader uses an 8.75-inch (222 mm) coating roll. Just because you’re buying an industrial roll coater doesn’t mean you can’t get excited about it. We mix high performance with passion, producing the best machines through research, experimentation and time tested principles. Our roll coaters are powerful machines that have taken us 133 years to perfect. They’re refined to the smallest detail in our very own laboratory outside Chicago. …and it’s no accident that all of our roll coaters are accented in explosion orange. Roll coating machines are designed to apply a liquid or adhesive to an object. The product is sent through the roller and the adhesive is spread across it. There are over 20 different combinations and positions that the rollers can take depending on the machine type. All of these variations help create the right depth of adhesive for what you’re coating. What kind of adhesive are you applying? If it’s a solvent or liquid prone to evaporation, you’ll need a roller that’s covered and uses pumps to agitate so the adhesive doesn’t become hard. If it’s latex, the machine will be designed to stop lumps from forming. If your adhesive doesn’t easily flow, it may have to be pumped to the metering site, where it’s shaved down to an accurate coating thickness, or an extra pickup roll may be used. What is the thickness of your substrate? The substrate is what you’re coating, and its character will help determine the amount of coating that leaves your roller to adhere to it. You may know how thick the substrate must be, or you can find out from our coating experts at Black Bros. Determining whether you need, for instance a dual or single feed roll, or an offset pressure roller can be decided once we know what thickness of coating you’d like to create. What is the width of your substrate? Not to be confused with adhesive thickness, the width is important to know so you’ll always assured of a full surface coat even if your product is inserted crookedly into the machine. Do you want a full coat or a partial coat? You’ve got a lot of options in how you apply adhesive to your product – from partial sheet and full surface to stripes and patterns. How do you want your product handled after coating? The exit of newly coated product can be managed in a variety of ways. 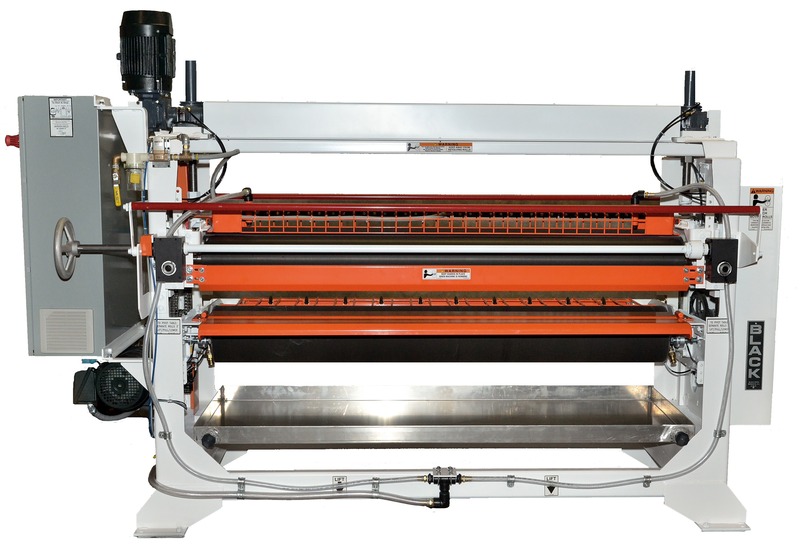 We have tools for every machine – and uniquely we can even grow with your business if you purchase a roll coater first and later come back for lifts, stands or indexing stations. You’ll need to take care of your machine – and may consider removable rollers, washing systems for rollers, removable coaters, tanks and on-board flushing. Once you’ve decided on the best variety of machine for your needs, we’ll be able to help you test your selections on the very products that you’re coating. The 22-D is a popular, all-around machine, which is as much as 30 percent heavier than its competitors. This gives the 22-D rigid roll alignment, more durability and the flexibility to take on bigger projects. It provides you with a narrow coating width, while its 6.5 inch rolls create a deeper reservoir than typical machine width ranges. It’s ideal for small to medium sized products, and has more features than the 755 Spreader and Coater. The 775 is compact and economical, with fewer components than its rivals making it easy to use and maintain. This model is sleeker and easier to maintain than other machines. It’s glue spreaders come in three sizes, which are 44”, 56” and 68”. This model is wonderful for companies that need a roll coating machine, but cannot justify the expense of a more aggressive model. Still, this machine can be equipped with cooled or heated rolls, and a sensor that keeps the coating material at a preset level. The 40-C tabletop Portable Adhesive Spreader provides the most efficient gluing method for small production requirements, for flat stock up to 14 inches (35.6 cm) wide. This coater is driven by a 115-volt gear motor with thermal overload protection, making it a welcome addition to many smaller manufacturers. The Differential Direct Roll Coater can apply UV adhesive with its independent variable speed drives. These are mounted on a coating roll, direct or reverse rotating doctor roll and a conveyer belt. With this machine you get fast roll changes and a lot of versatility. It’s designed for light to heavy viscosity solvent or water based coatings such as stain, tint, color and protective barriers on wood, plastic or metal to name a few. Whether you’re in the roll coater market for the first time or you’re an old hand, Black Brothers will get you just the advice and equipment that you need at competitive prices.